DURANGO, Colo. -- Nearly 700 more homes were evacuated Sunday morning as the 416 Fire burning north of Durango nearly doubled in size overnight, La Plata County officials said in their latest update as firefighters continue to attack the blaze in southwest Colorado. 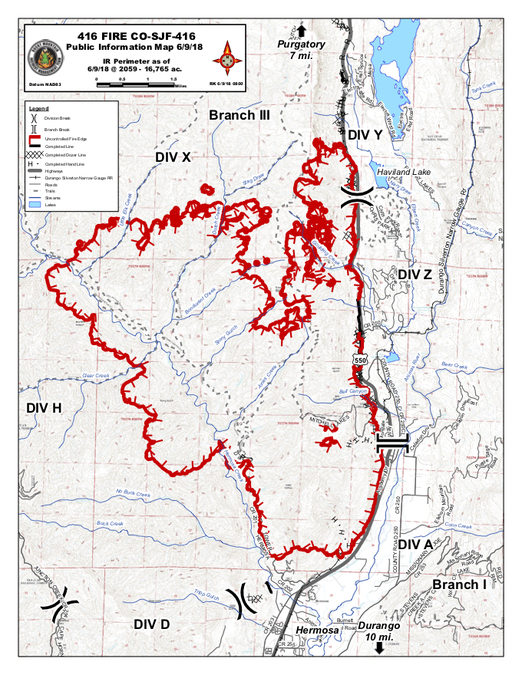 A mandatory evacuation order was issued for homes in Purgatory/Durango Mountain Resort, Lake Purgatory, Silver Pick Lodge, Cascade Village, Mill Creek, as well as homes on both sides of U.S. Highway between mile markers 46.5 to 53.1. At least 675 homes are affected by the new evacuations. U.S. Highway 550 will close indefinitely to both northbound and southbound traffic from Cometti/Mead Lane in Hermosa at mile point 32.2, to Cascade just north of Purgatory at mile point 53. Officials said evacuees will be escorted through the closure zone, adding there was also a closure point at Silverton. Officials are asking residents to evacuate the area as soon as possible. For up-to-date information on evacuation status, you are asked to call the La Plata County Emergency Operations Center at (970) 385-8700. You can also visit www.co.laplata.co.us . Sunday is expected to be another tough weather day for firefighters battling the 416 Fire burning about ten miles north of Durango as conditions are expected to be dry and windy, with potential gusts up to 35 mph. Todd Pechota of the Rocky Mountain Incident Management Team, said the combination of weather and fuel conditions is creating significant potential for fire intensity and growth Sunday. The fire grew overnight on the west and northwest sides, an area that is National Forest land and not anywhere near homes. The rapidly-growing wildfire has now burned 16,766 acres and is still only 10 percent contained, La Plata County officials said Sunday. The fire is burning on the west side of U.S. Highway 550 on some private land and on the San Juan National Forest. The fire is burning in grass, brush, and timber. Fire officials say no structures have been lost, but large-scale evacuations are still in place. Sunday's evacuees join the approximately 1,300 people who are under a mandatory evacuation in the area. Fire officials say terrain is rough and inaccessible in many areas making the fight that much more difficult for crews on the ground. More than 800 firefighters are now battling the 416 Fire and are being assisted by nine Type 1 hand crews, 11 Type 2 hand crews, 44 engines, five dozers, four water tenders and four Type 1, two Type 2 and two Type 3 helicopters.